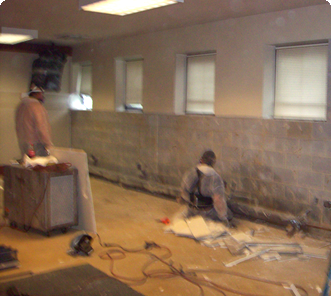 In December of 2009, NBC was contracted to remove mold from a basement in Delaware County. After a thorough cleaning and inspection to remove the mold, we sealed the wall to ensure that the problem would not return. Mold can be found everywhere, both inside and out doors. It can grow on almost anything when moisture is present. Molds reproduce using spores that are carried by air currents. When these spores land on a moist surface they begin to grow. Mold is normally found indoors at levels that do not affect most individuals, but in rare cases mold can cause allergic reactions or become toxic. The most common problem with mold is that it grows on walls and other materials which is unsightly and ruins the material. Flooding, leaky roofs or basements, maintenance problems, or plumbing issues are usually to blame for mold inside homes, schools, or office buildings. NBC Environmental is a Certified Mold Inspector in Pennsylvania (PA), New Jersey (NJ), and Delaware (DE). Mold Inspections: Water can get just about anywhere and where there is water, there is often mold. If you suspect that you have mold, we can help you determine whether you have a problem and what you can do about it. Mold Remediation: The term "remediation" is used rather than "removal" because getting rid of mold is a process. We have the experience necessary to make sure that we remove all the mold the first time and take steps to ensure it won't grow back. 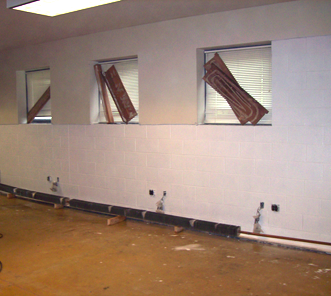 Post Remediation Wall Sealing: Water is mold's friend and your enemy. We have years of experience sealing walls after they have been treated for mold to make sure that the mold doesn't grow back. Wall and Floor Treatment Replacement: Mold often grows on walls, floors, and ceilings that have been already been treated. We leave our jobs with more mold protection than they had when they were new.